WASHINGTON - The escalating political battle over special counsel Robert Mueller III's report centers on redactions - a lawyerly editing process that has angered distrustful Democrats eager to see the all evidence and conclusions from his 22-month investigation of President Donald Trump's conduct and Russia's elaborate interference operation during the 2016 election. Attorney General William Barr is redacting at least four categories of information from the report, which spans nearly 400 pages, before issuing it to Congress and the public. Legal experts say he has wide discretion to determine what should not be revealed, meaning the fight over blacked-out boxes is likely to spawn months of fights between Congress and the Justice Department, and it may end up in the courts. The first public confrontation is imminent, with Barr scheduled to appear Tuesday and Wednesday before the House and Senate Appropriations committees for hearings ostensibly about the Justice Department's budget. He is expected to face extensive questioning about the Mueller report and his ongoing redaction process, though, and his testimony will be scrutinized for any sign he is trying to protect the president. "There's a lot of pressure all pointing in the direction of doing a robust release, said John Bies, who held senior roles in the Justice Department during the Obama administration and now works at American Oversight, a liberal watchdog group. "We are very hopeful the attorney general will do the right thing here and make everything public that can lawfully be made public." Barr has promised to release the redacted report by mid-April, having announced in late March that Mueller did not find a conspiracy between Russians and Trump or his campaign and that Mueller decided not to reach a conclusion about whether Trump obstructed justice. The attorney general and his deputy, Rod Rosenstein, looked at the obstruction evidence and determined it did not rise to the level of a crime, Barr wrote. The president's critics questioned whether Barr soft-pedaled Mueller's findings, concerns that intensified after recent reports indicating some on Mueller's team are unhappy with the brevity of Barr's initial report to Congress and believe more could and should be said about the seriousness of what they found. Barr is working with Rosenstein, Mueller and their key aides to produce an edited version of the report. In a March 29 letter to lawmakers, he spelled out four areas that would be redacted: grand jury material, which could include any documents and testimony presented; information that could reveal the government's intelligence-gathering sources or methods; information that could compromise ongoing investigations; and details that would violate the privacy of those deemed "peripheral" to the investigation. All of those categories give Barr significant latitude to decide what to leave in and what to take out of the report's public version, none more so than the grand jury material. Under the federal rules of criminal procedure, government officials are not allowed to share material from grand jury proceedings. There are few exceptions. "Prosecutors generally take a broad view of what constitutes grand jury information in order to avoid inadvertently disclosing it, but here there's a strong counterbalancing interest in ensuring that everything that can come out does come out," Bies said. Mueller's investigators issued more than 2,800 subpoenas and executed nearly 500 search warrants, so the potential grand jury material is voluminous. In an odd stroke of timing, the federal appeals court in Washington issued a ruling Friday in an unrelated case that buttresses the argument for keeping a close hold on grand jury information. The panel ruled judges may not carve out new exceptions to the current grand jury secrecy rules - though it also affirmed that grand jury material can be shared with the House of Representatives under an exception that dates to 1974 and a ruling by U.S. District Judge John J. Sirica during the investigation of President Richard Nixon. Justice Department spokeswoman Kelly Laco said the agency was "pleased that the court reaffirmed the Department of Justice's long-standing position and Supreme Court precedent that the proper functioning of the grand jury depends on the confidentiality of proceedings. The Department of Justice will continue to defend the long established tradition of protecting grand jury information," Laco said. House Judiciary Committee Chairman Rep. Jerrold Nadler, D-N.Y., has been pushing the attorney general to ask a judge to approve the release of grand jury material, but Barr has made no move to do so. Nadler is authorized to subpoena Mueller's full report, with the committee voting along party lines Wednesday to grant him that ability, though to date, none has been issued. "It's disturbing there has been no announcement of any effort to ask the presiding judge of the grand jury to clear the material," said Walter Dellinger, a Duke University law professor who served in the Clinton administration. "The amount of legitimate redactions should be quite small," he said. "I don't believe there is any reason to redact any material for the sole reason that it is derived from grand jury proceedings." While Barr's public letters to lawmakers since Mueller submitted his report sought to assuage any concerns that the attorney general is providing political cover for the president, with every day that passes, the pressure intensifies on Barr to show that he is not playing politics with a high-profile criminal investigation into Trump and his advisers. Late last month, the attorney general informed lawmakers in writing that he would not submit Mueller's report to the White House to review for any material that might be covered by executive privilege, which allows the president and other senior officials in the executive branch to withhold some information from Congress, the courts and the public. But Barr's phrasing in that letter is somewhat ambiguous. 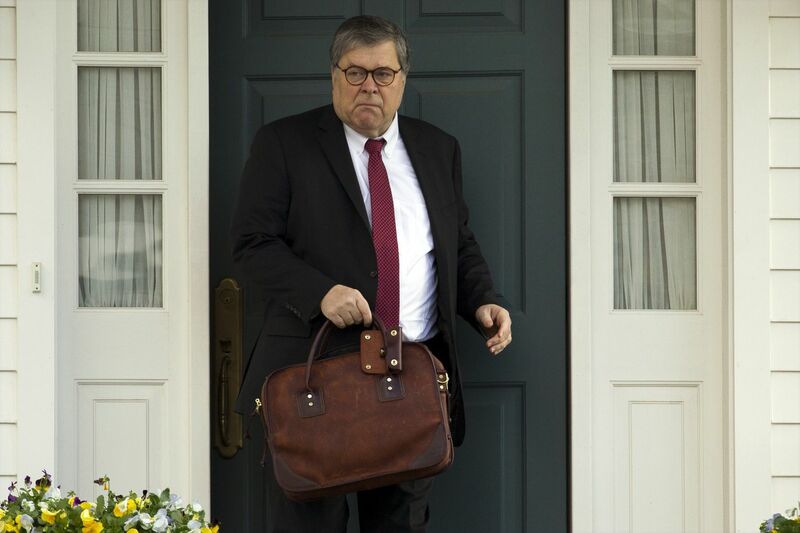 "Although the President would have the right to assert privilege over certain parts of the report," Barr wrote, "he has stated publicly that he intends to defer to me, and, accordingly, there are no plans to submit the report to the White House for a privilege review." A Justice Department spokeswoman declined to say whether this means there will be no claims of executive privilege invoked over any part of Mueller's report or whether Barr might, at some point, advise Trump to invoke the privilege over some sections or whether Barr might do so unilaterally. That last option seems least likely, particularly given Barr's previous legal work. A 1989 legal opinion written by the Justice Department's Office of Legal Counsel (OLC) reiterated long-standing agency policy that the attorney general and others could advise the president on when to invoke the privilege, but the only one who can invoke it is the president. That legal opinion, "Congressional Requests for Confidential Executive Branch Information," cited a 1982 "Reagan Memorandum," which "provides that executive privilege cannot be asserted without specific authorization by the President, based on recommendations made to him by the concerned agency head, the Attorney General, and the Counsel to the President." The author of that 30-year-old memo was the head of the OLC at that time: William Barr.